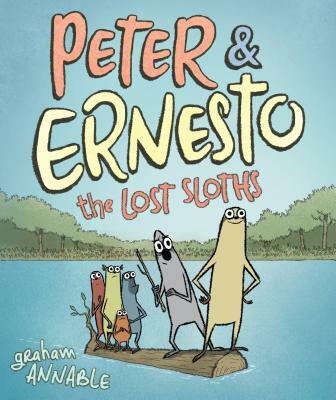 From Box Trolls director Graham Annable comes Peter & Ernesto: The Lost Sloths, the immensely charming sequel to his brilliant debut graphic novel about the endearing friendship between two sloths. Peter and Ernesto loved their tree. Then a hurricane came and blew it away! Now, Peter, Ernesto, and the rest of their sloth friends must venture into the jungle to find a new—great—tree. But the jungle is full of dangers, including angry ants, slithering snakes, and a ravenous jaguar! Can cautious Peter and confident Ernesto work together to keep their tribe safe? They’ll have to, if they want to find the perfect tree to call home! Graham Annable is an Oscar-nominated cartoonist and animator living in Portland, Oregon, with his wife, and two boys. When he's not huddled inside of his house creating graphic novels like Peter & Ernesto for early readers, he spends the rest of his time working on feature films, animated shorts, video games, and indie comic books. He's rather fond of hockey and sloths. But never the two combined.